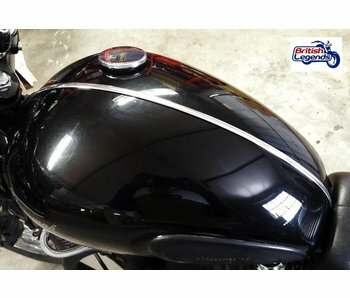 Fly-screen for Triumph Bonneville sold as a complete kit. DART brand, made in England. 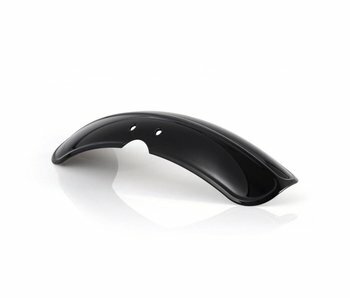 Aluminium front fender, exceptional hand-made quality. Specifically designed for Triumph Twins - this is not a universal item, and will fit perfectly! Applications and details see below. 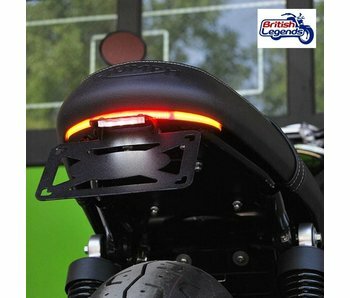 Tail tidy for a sharp and modern look at the rear of your bike. Complete kit, ready to fit. Hig-quality re-creation of a classic design in British auto and motorcycle racing... Solid aluminum, made in England. Specific fitting to Triumph tanks. 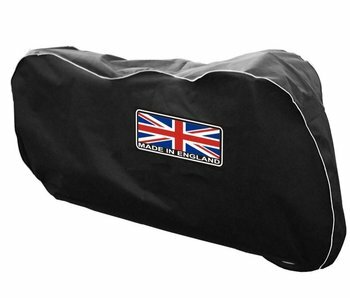 Dust Cover "Made in England"
Dust cover specifically designed for modern Triumph motorcycles, for indoors use. Available in many sizes to fit your bike. Carbon fiber side panels for Triumph Twins. Sold as a pair. See details and applications below. Rear fender in aluminum for Bonneville, Street Twin, Street Cup, Scrambler and Thruxton. Hand-made in high-quality aluminium. 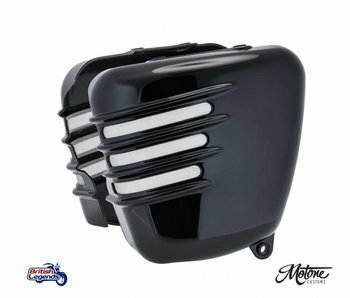 Aluminum fuel tank for Triumph Twins EFI (865cc). Polished "mirror" finish, or raw alloy to be painted. Gives a retro look to your bike, like 50s/60s vintage models (the trim was used to hide the welding of the two "shells" of the tank). Pair of new fuel tank knee pads in high-quality synthetic rubber. Sold as a pair. 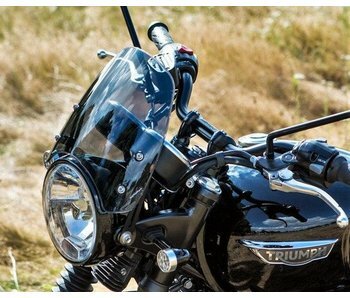 Tail-tidy panel for a "no-fender" short rear on Bonneville, Thruxton and Scrambler. LED tail-light included (choice of two designs). "Bikini" fairing for Triumph Bonneville, Thruxton, Thunderbird and Legend - sold as a full kit, ready to fit (fixings included). 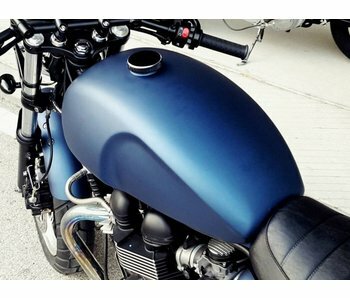 Front fender in ABS for Bonneville, Street Twin, Street Cup, Scrambler and Thruxton. Painted gloss black, ready to fit! 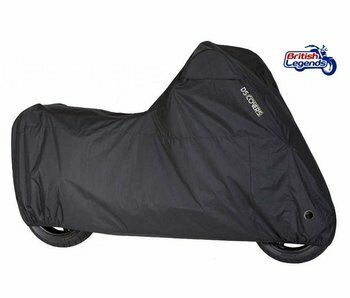 High-quality motorcycle cover for full weather protection. Available in 4 sizes to fully "fit" your bike. 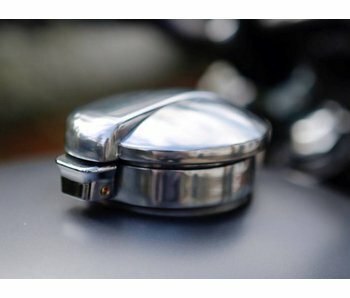 Solid aluminium fuel filler cap for Triumph motorcycle. Choice of finishes. 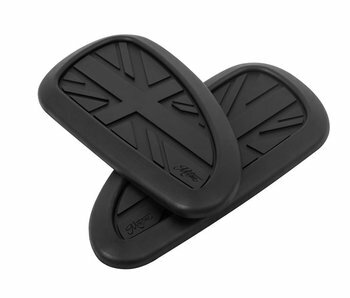 Pair of side covers "cafe-racer" style, design British Legends and manufacturing "Made in Burgundy!" 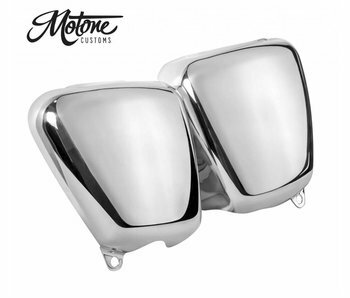 Pair of Bonneville/Thruxton side covers in aluminium, choice of polished "mirror" or brushed finish. Priced per pair. Fly-screen for Triumph Scrambler sold as a complete kit. DART brand, made in England. Solid-aluminium screws for the side panels, combining functionality and improved look. Sprocket cover in aluminum for Bonneville, Scrambler and Thruxton (2001-2016). Made by MAS Engineering, hand-made in Italy. Chain guard in aluminum for Bonneville, Scrambler and Thruxton (2001-2016). Made by MAS Engineering, hand-made in Italy. Pair of side panels in black moulded ABS, finished with fine mesh. Price per pair. Fly-screen for Triumph Thruxton 900 sold as a complete kit. DART brand, made in England. Number plate holder "retro-style", to be placed at the back, under the seat on the right or left side (or both ! ).